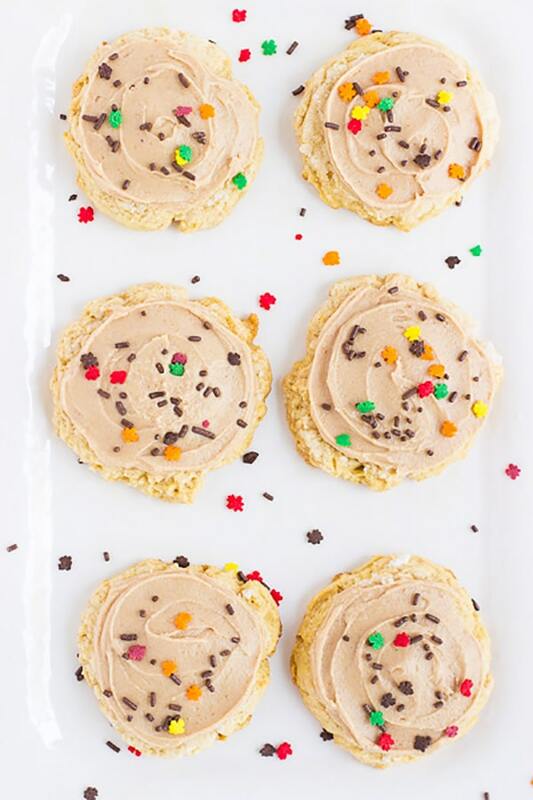 Need an easy, last minute Thanksgiving dessert? 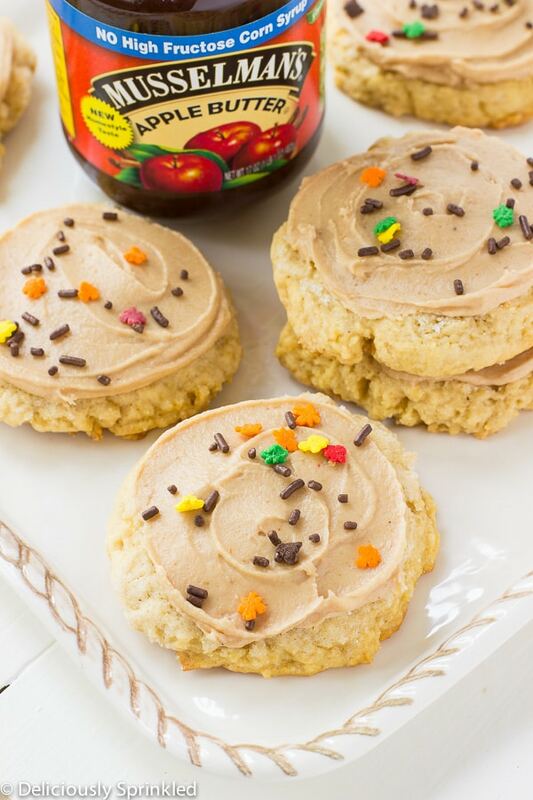 These delicious Apple Butter Sugar Cookies are soft, chewy and the apple butter frosting is to die for! 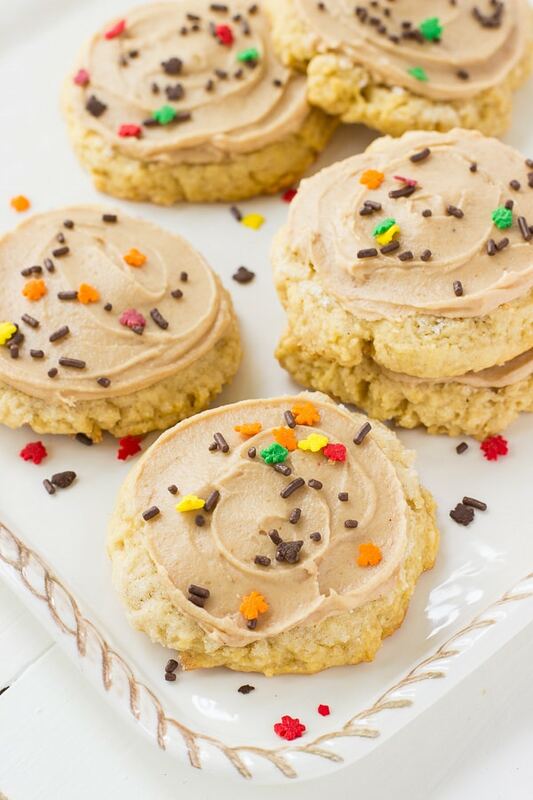 To make the frosting I used Musselman’s apple butter and let me tell you, it took these traditional sugar cookies to a whole new level of yumminess. 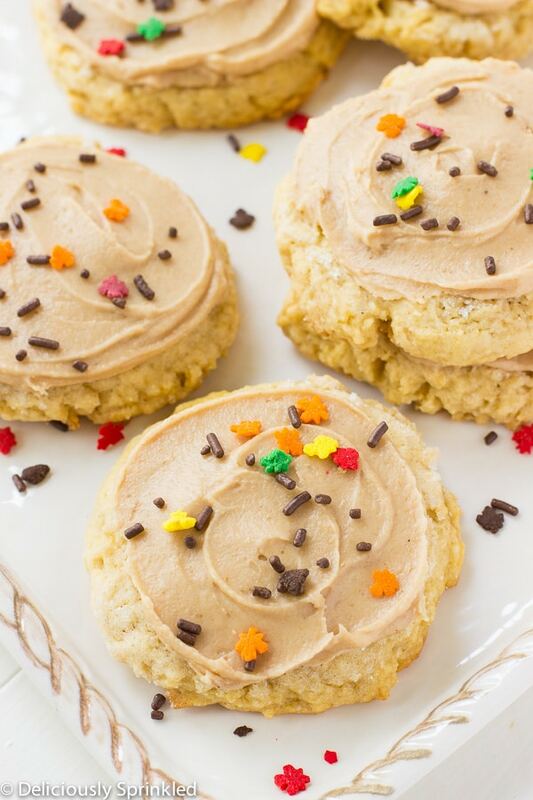 These Apple Butter Sugar Cookies have all the flavors of fall/Thanksgiving that the whole family will love. ● APPLE BUTTER: 1/4 cup apple butter. My favorite apple butter is from Musselman’s. ● VANILLA EXTRACT: just 1 1/2 teaspoons vanilla extract. ● ALMOND EXTRACT: 2/4 teaspoon almond extract. ● ALL-PURPOSE FLOUR: 3 1/2 cups all-purpose flour. ● BAKING POWDER: 1 1/2 teaspoons baking powder. Just a quick baking tip, make sure your using a new container of baking powder. ● SALT: just 1/2 teaspoon salt. 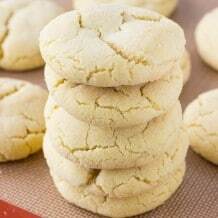 ● POWDERED SUGAR: 4 cups of powdered sugar to make the frosting. STEP 1: In a large bowl, cream butter, apple butter and sugar until light and fluffy. STEP 2: Beat in eggs, egg yolks, vanilla and almond extract. STEP 3: In another bowl, whisk flour, baking powder and salt. STEP 4: Add dry ingredients into wet ingredients and mix until just combined. Do not overmix. STEP 5: Shape dough into a disk; wrap in plastic wrap. Refrigerate for 1 hour. STEP 6: Preheat oven to 375F degrees. Using a cookie scoop or ice cream scoop, scoop dough into balls about 2 Tablespoons each, place onto prepared baking sheet. Put 1/4 c of sugar and a pinch of salt in a dish. Stick the bottom of a glass in it. 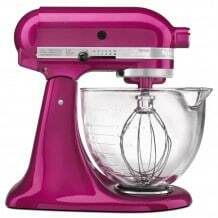 This is going to be your cookie press. Firmly press it into the center of your dough ball. You want your dough to spill out over the sides of the glass. If there is a lip it’s even better. Bake for 10-12 minutes or until edges begin to brown. Let cool before frosting. STEP 7: In a medium-sized bowl, mix powdered sugar, apple butter, melted butter and vanilla extract together until combined. 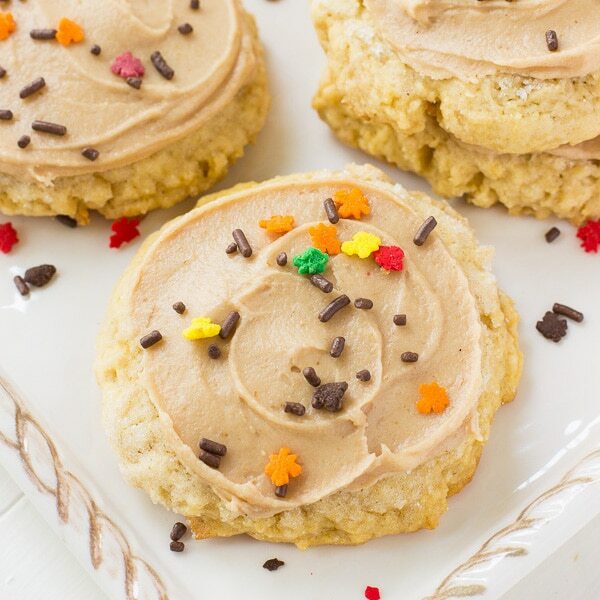 Frost cooled cookies and sprinkle with sprinkles. 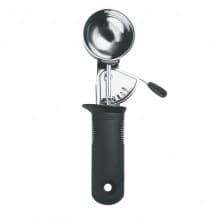 COOKIE PRESS: After you scoop the cookie dough into balls, you want to use the bottom of a glass (see below) to press the cookie dough balls into a flatter cookie. I also like to dip the bottom of my glass into a bowl of sugar, this helps the dough not to stick to the bottom of the glass. In a large bowl, cream butter, apple butter and sugar until light and fluffy. Beat in eggs, egg yolks, vanilla and almond extract. Add dry ingredients into wet ingredients and mix until just combined. Do not overmix. Shape dough into a disk; wrap in plastic wrap. Refrigerate for 1 hour. Preheat oven to 375F degrees. 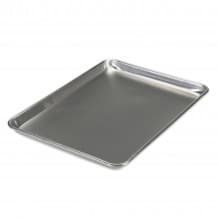 Using a cookie scoop or ice cream scoop, scoop dough into balls about 2 Tablespoons each, place onto prepared baking sheet. Put 1/4 c of sugar and a pinch of salt in a dish. Stick the bottom of a glass in it. This is going to be your cookie press. Firmly press it into the center of your dough ball. You want your dough to spill out over the sides of the glass. If there is a lip it’s even better. Bake for 10-12 minutes or until edges begin to brown. Let cool before frosting. In a medium-sized bowl, mix powdered sugar, apple butter, melted butter and vanilla extract together until combined. 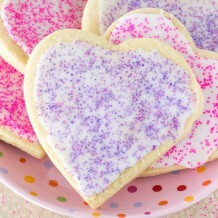 Frost cooled cookies and sprinkle with sprinkles. 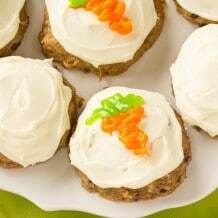 Now these look like a perfect fall treat! Love this idea! Apple butter is one of my favorites. 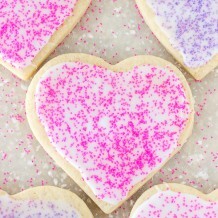 Never thought about adding it to cookies…yum! 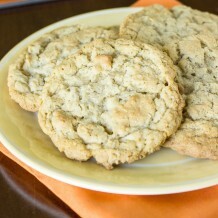 The apple butter makes these cookies so tender and delicious. Love them! 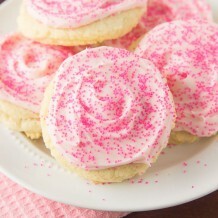 Using apple butter in sugar cookies is such a great idea! Yum!